Til death do us part? Sometimes even death isn?t enough to keep husband and wife apart! "By popular demand, GDS will stage Noel Coward?s timeless comedy in May 2017. 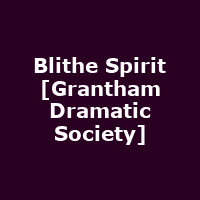 A delightful blend of verbal wit, memorable characters, and improbable situations, Blithe Spirit has charmed audiences over the years and GDS looks forward to bringing their version to the Guildhall. When writer Charles Condomine decides to hold a séance for research purposes, he doesn?t expect the ghost of his first wife to end up living with him and his current bride! A capricious spirit, Elvira wants Charles all to herself, while straight-laced Ruth wishes he would stop talking to thin air. Can the medium - flamboyant Madame Arcati - put things right or will the unhappy trio be stuck together forever?"